Architecture has progressed through many different styles and all someone here in the U.S. has to do to see a variety of those styles is to drive through any major city. Glance to your left and right, there are Victorian homes with mass amounts of detailing, Mission style dwellings following the Frank Lloyd Wright style, Bungalows which demonstrate the Arts and Crafts movement and the list goes on. In commercial buildings an enthusiastic visitor can find structures that were built in styles such as Art Deco, Neoclassical, Gothic, Gothic Revival, Chicago Style, LEED-certified homes, etc. Today’s style has not been officially named. We have moved past Post-Modernism and Contemporary to a mixture of styles with the addition of sustainability and renew-ability. And if I were asked to pick a place that is leading this new architectural revolution, I would have to showcase California. In short, California has implemented new sustainable laws, practices and policies making life truly more green for its residents and its businesses. One company based out of Berkeley, CA that can be classified as a leading example in this sustainable revolution is Sun Light & Power. Sun Light & Power has been in the sustainable business of providing solar solutions for commercial and residential projects since 1976. They work with both solar electric (Photovoltaic or PV) and solar thermal (hot water and pool heating) applications. Plus they offer a custom system for each individual site, power requirements and budgets. We offer Total Energy Solutions™, providing our customers with smart, cost-effective energy packages that combine solar electricity and solar water heating, along with energy efficiency and conservation. Sun Light & Power is a certified B Corporation which is received from B Lab, a non-profit organization, that acknowledges new types of corporations that use their business to help solve social and environmental problems. This is similar to how buildings receive a LEED certification, through a vigorous qualification checklist. A few examples of the work that they have done to date are: NorthCreek Church, San Francisco Zen Center, Crescent Park, Berkeley Horticulture, City of Beverly Hills Civic Center Complex, Casa Feliz, Standford University’s resident halls, Prospect Sierra Elementary School, Presidio Trust, San Francisco Food Bank, National Holistic Institute, Dosa restaurant and Taco Bell in Racho Cordova, CA. 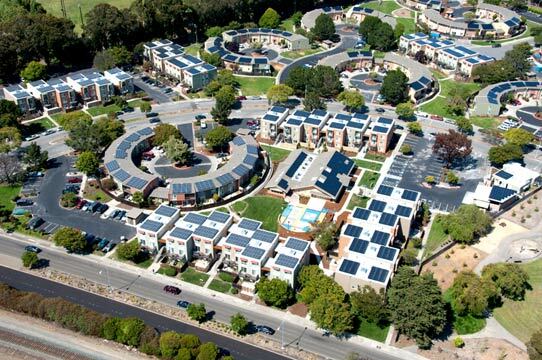 These buildings show a wide range of the positive changes that the unique and individualized solar systems provided by Sun Light & Power can have on a building’s energy consumption and pollution reduction. The San Francisco Zen Center was built in 2005, has an estimated annual CO2 reduction of 573,406 lbs. and an estimated annual electricity production of 377,189 kWh. At a much smaller scale, the Berkeley Horticulture center was built in 2006, has an estimated annual CO2 reduction of 11,293 lbs. and an estimated annual electricity production of 9,411 kWh. Finally, at a much larger scale, Crescent Park was built in 2009, has an estimated annual CO2 reduction of 1,464,998 lbs. and an estimated annual electricity production of 1,220,832 kWh. These demonstrate the astonishing figures of pollution that is being reduced each year and the ability of the structures to produce their own energy. The list of projects that Sun Light & Power has completed, is like architectural styles, it keeps going, is ever changing and is able to adapt from existing conditions. “Sun Light & Power Goes Beyond Solar. There are companies that attempt to greenwash by giving lip service to their environmental practices. 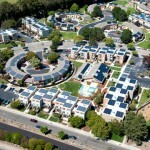 And then there are companies that are awash in truly green technology. Sun Light & Power is a great example of a company that has integrated clean technology and energy efficiency throughout its organization.” Matter Technology, March 20, 2009. Most companies will willingly do the work when they are receiving compensation, but when a company is willing to do non-profit projects just to better the environment and the cost of running a business, they are truly unique in their aspirations. Buildings with the correct solar system for their structure are some of the most beautiful dwellings of today’s architectural accomplishments. Sun Light & Power are one of the businesses that can be credited with changing the way architecture will be viewed in the future.